A Day in the Life of Stevie Brock! Septermber- Gosh it's been 4ever since I've updated this! Sorry Guys! But Stevie is now a very very VERY busy guy! He's rehearsing, practicing and everything! He's a really busy boy now and days. He just got off of tour with Aaron Carter and they are setting up some winter tours so he can see you guys out on the road! May- Stevie's video All For Love is now available 2 view! It is showing on AOL Kids Only Video Vault! It has been announced that this June 10 the long-awaited, self-titled album will debut! 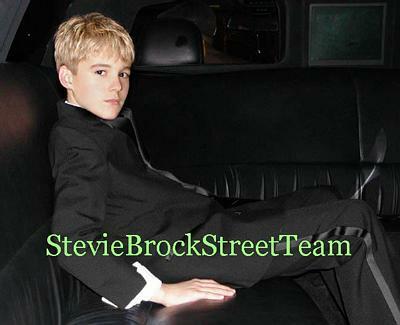 On Thursday May 8 Stevie's song was up for voting on Nickeloden's Nick Video Pick of the day! April-Another busy busy month! Stevie attended the Nickeloden Kids Choice Awards and many fans spotted him on TV in the audience. Stevie also appeared in more magazines this month. Radio Disney is playing the song "All For Love"! Remember 2 keep requesting! March- Stevie ended his tour. He recorded his video "All For Love" on March 11 I believe was the date. His song "All For Love" premiered on the Radio Disney Top 30 Countdown at #22! GREAT JOB! Stevie also made #3 on The Radio Disney Dot Com Top 3! Wow! He's had a great month. He's also busy now in FL working on his album. February- Stevie is busy busy busy! He is now on tour with label-mates Triple Image and Jer-Z! The show is full of energy and excitement! February-Stevie is really busy rehearsing for his tour. His schedule is getting jam-packed. Soon he will start out on tour! January-On the Stevie chat I asked Stevie what a day in his life is like. He said that as of now it's still just a normal day of school and the usaul kid stuff. He is practicing dancing and singing for his upcoming tour. It sounds like he's working really hard. Keep up the great work Stevie!